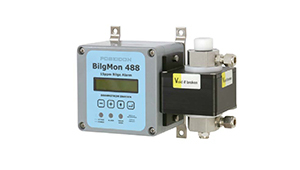 The 15 ppm Bilge Alarm type BilgMon 488 is approved and certified in accordance with the latest IMO resolution MEPC 107(49) and, in addition, designed to meet the particular needs from the crew when processing the bilge water. The BilgMon 488 has a unique system of replacing the old measuring cell with a new one, and still keep all data saved in the memory. This function enables the crew to easily replace a damaged measuring cell, or attach a new calibrated measuring cell to the power module, when a calibration of the unit is needed. The replacement cell is delivered with a factory calibration certificate, and both units will be automatically updated after being joined together. The measuring cell has a heavy duty design, in order to resist the tough running conditions. The measuring principle by using IR light detection in the measuring cell, is a well proven and reliable examination method of the sample flow from the oily water separator. The processor in the power module will store all requested data, and this data will clearly be presented in a LCD at the front of the unit. Connection to an external printer is available if required, through a serial communication interface. The unit is also provided with a solenoid valve function for cleaning water to measuring cell.